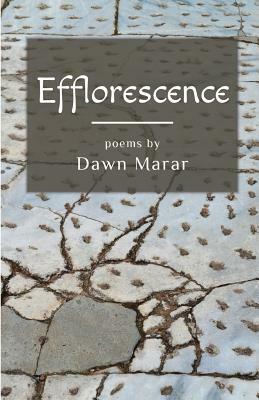 Dawn Marar's chapbook, Efflorescence, includes poems chosen as a finalist for The Pablo Neruda Prize for Poetry; Orison Anthology Awards for Poetry; Chautauqua Literary Journal; and a Pushcart Prize nomination. This collection draws upon her personal connections to the Middle East and her experience as an American, a woman, wife, mother, and activist. This collection of poems reflects Dawn's commitment to human rights and social justice-- concerns in both national and international spheres. She fearlessly takes on military occupation; war, including drone warfare; and contemporary imperialism. She does this with inventive language and form; and with deep humanistic values --with love, compassion, and humor. She challenges her own culpability as a citizen of the world. Through poetry, Dawn confronts the influence of consumerism, religion, and nationality as she travels throughout the Middle East. Through decades of experience, Dawn's poetry celebrates the resiliency of the human spirit. Dawn has lived in Jordan and travels extensively. This collection recounts her travels to the Palestinian Territories, Israel, Syria, Turkey, Morocco, and Egypt. Her poetry takes the reader from the top of Mount Nebo, to the banks of the Jordan River, to Taksim Square in Istanbul during a tense May Day celebration. Some of Dawn's poems are experimental. She invented her own poetic form, the pronghorn, inspired by the classic poetic form, the ghazal. Her work references poetic traditions of form (haibun, ghazal, ekphrastic); literary traditions (Arabic folktales) and poets (Wallace Stevens). Dawn has studied with the poets Major Jackson, Bernadette Mayer, Alan Shapiro, Kevin Young, Rebecca Wolff, and John Montague. Her poems explore language; incorporating Arabic words and phrases. The reader accompanies Dawn, her husband (who was born in Jordan and raised in Baghdad) and their children as they partake of the everyday life of Jordanians, and other Arabs. The reader is afforded an intimate look at how families everywhere share the same concerns for health and safety. The time frame of the poems extend from 1981 through 2017. The work addresses the Iraq war and the Women's March on Washington. The collection spans a wide geography: from a village in New York State to the banks of the Jordan River. She explores spiritual, religious, historic, and Biblical places. The chapbook's title, Efflorescence, invites readers to consider the role of the United States in the world at a seminal point in our history. The work challenges readers to reflect upon the effect of culture and national identity in shaping our lives and the world we live in. The poems reveal an individual life as citizen of the greater world. Dawn's poetry is not a diatribe, but a meditation on one's role in shaping a better world for all. Through language simple and direct, Dawn paints "winged sumac, scarlet oak, sugar maple leaves that] burst into flames" when seen through tears. (from "Working Out"). She captures the irony of life: "A fig tree housed/in winter bears fruit, despite/a new world order." (from "Sparkles) And the painful irony of being in Istanbul during a government lock-down, while back home, in the States "marchers protested the death/of Freddie Gray following injuries/sustained in police custody" (from "Mayday Mayday Mayday). Ultimately, Dawn speaks truth to power when she cites the Twitter account of a foreign leader notorious for silencing writers. Dawn earned a Bachelor's degree from Skidmore College and a Master's degree from Columbia University. She worked with social justice and human rights groups as a planner and community organizer.